Click here to view some sample pages, which have been put together using History Through the Ages timeline figures and our own category stickers. Do you not have room for a wall timeline, but still want the benefits of creating one with your students? Here is your solution. History comes alive when your student records significant historical events in his own hand. This blank timeline book with dates pre-marked from 5000BC to the present will allow your student to gain a better understanding of the flow of history. He will make connections between historical events by recording entries across academic subjects—kingdoms, empires, rulers, scientists, literature, great writers, musicians, and so much more—all can be recorded into his own personal book of history. Wonders of Old is divided into four historical time periods: ancient, medieval, new world and modern. Significant dates are listed at the conclusion of each section as a helpful reference. This hardcover book measures 9x12 and is printed on extra thick 70# paper for durability. Also available on CD-ROM to print from your PC or MAC. 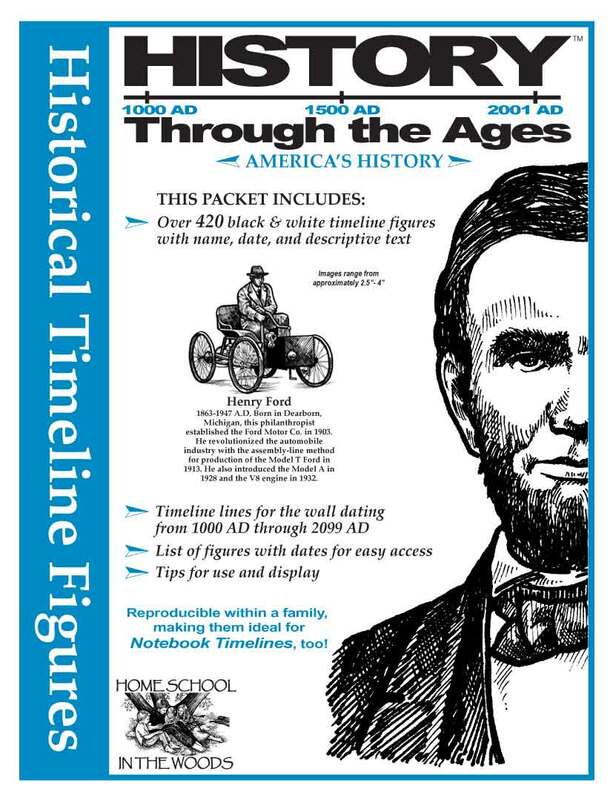 New from Homeschool in the Woods - A Collection of Historical Timeline Figures on CD-ROM. This two CD-ROM set comes with over 1,260 black and white timeline figures dating from 5000BC to the Present. Just click and print! $74.95 - Save nearly $15 over purchasing the hardcopy sets.